STAR WITNESS (AUS) (Chestnut 2007-Stud 2011). 4 wins-3 at 2-to 1200m, VRC Coolmore Stud S., Gr.1. Out of SW Leone Chiara. Sire of 50 rnrs, 20 wnrs, inc. SW Pearl Star (SAJC Dequetteville S., L), The Barrister - High Volatility (H.K. ), Well Sprung, SP Kimberley Star, Mella Maria, Serenade, Lineker, Typhoon Witness and of Rare Occurrence, Magic Alibi, Stellar Collision, Enjoyable, Last Witness, Moroccan Ruby, Nagging, Guilty as Sin, Litigation, etc. His oldest progeny are 3YOs. Magic Alibi (f. by Star Witness). Winner. See below. This Magic Moment. Winner. See above. The Gangster. Winner at 1500m in Macau. Sweeping Beauty. 4 wins from 1600m to 2100m, STC IGA Allambie Heights H., 3d AJC Metcash H., STC Beverley Hills Hotel H. Producer. Red Hot Pistol. 3 wins to 1000m, BTC Pine Rivers P., 2d QTC Easycraft Innovative Wall Linings H., Ideal Lifestyle H., Sharscay H., 3d BTC Hawkins Media Solutions H., Kennedy Classic H.
Clear Respect. 2 wins at 1200m, 1400m, 3d AJC Qantas Airways H.
Albarista. 5 wins to 1200m, 3d STC Winter Special 2YO H.
Bullion Express. 2 wins at 1100m, 1400m, 3d MRC (Mornington) Australian Precision Panels H., 4th MVRC Mitchelton Wines Vase, Gr.2. For Granted. 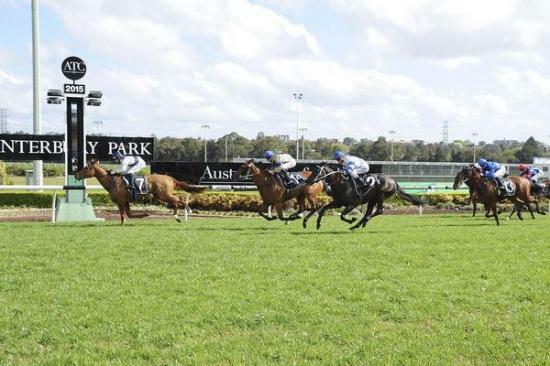 9 wins at 1000m, 1100m, MVRC Carlton Draught Flying H., STC Sudler & Hennessey P. Producer. Promising Joy. 14 wins-1 at 2-to 1350m, A$132,055, BTC John Silver Holden H., Qld Tatt's RC Country Cup H., QTC Breakfast Creek Cricketers' Club H., 2d BTC Robert Corbett - The Good Guys H.
Orbiton. 4 wins to 1400m, STC Fiji Visitors Bureau H.
Implicit. 6 wins to 1300m, 3d STC Yuletide 2YO H.
Simple Pleasures - Duel Time (Aust.). 5 wins-1 at 2-to 1400m, 3d AJC Greta Innes-Brown 2YO H.
TRISTRAM ROSE (Sir Tristram). 3 wins. See above. Another Colour (Riverton). 4 wins from 1200m to 2450m, 2d Greyville Lonsdale Stirrup Cup, L, St Andrews Eastern Province Derby, L.
HONOUR CODE (Marscay). 8 wins-1 at 2-from 1100m to 1800m, A$140,250, SAJC Adelaide Hilton Cup, Gr.3, Lord Mayor's Mile H., L, Ansett Australia H., Prettejohns Plants H.
FLAMBERGE (Exceed and Excel). 9 wins-2 at 2-to 1200m, A$1,099,630, to 2015-16, SAJC Goodwood H., Gr.1, ATC Sebring S., Gr.3, VRC Standish H., Gr.3, MRC Heath S., Gr.3, SAJC Durbridge S., L, VRC Living Legends H., MVRC Programmed Property Services 2YO H., 2d MRC Rubiton S., Gr.2, MVRC Ian McEwen S., Gr.2, VRC MSS Security S., L, 3d MRC Kevin Heffernan S., Gr.3, VRC Bob Hoysted H., L.
CURTANA (Exceed and Excel). 6 wins-2 at 2-at 1000m, 1200m, A$652,600, VRC Gucci Red Roses S., L, 2d VRC Coolmore Stud S., Gr.1. COUNTRY LODGE (Grand Lodge). 2 wins at 1400m, A$306,100, VRC Vanity S., Gr.3, Beachside H., 2d VRC AV Kewney S., Gr.2, 3d VRC Chubb S., L. Producer. SATURDAY SKIES (Any Given Saturday). 5 wins-2 at 2-from 1000m to 1800m, A$212,781, to 2014-15, WATC JC Roberts S., L, 2d WATC Magic Millions Perth 3YO Trophy, L.
CLAY FIGHTER (Clay Hero). Winner at 2, A$91,810, SAJC Sires' Produce S., Gr.3, 3d SAJC Oaklands P., L, Exalting H., Tabform H.
NOSMO KING (Cullen). 5 wins-3 at 2-to 1300m, NZ$100,019, CJC Welcome S., L, South Island 2YO S., L.
Race Record: 4 Starts 1-0-0 A$34,925. Winner at 1200m in 2015-16, ATC More Than Ready at Vinery P.